Today is the last day for entries for the very first Breakfast Club, a new event created by myself and Helen of Fuss Free Flavours. The idea is to get bloggers to focus on the first (and some say most important) meal of the day, and to challenge themselves to create more interesting and tasty breakfast. Helen is hosting this month and chose the theme “Asian“. Her choice was inspired by my Sri Lankan breakfast party, where I cooked egg hoppers for about twelve people. I could have made hoppers again, but I wanted to challenge myself too. I had planned to make sticky rice, but at the last minute I changed my mind and decided to go with another Sri Lankan dish – coconut pancakes. Usually in Sri Lanka these are not eaten for breakfast. I actually ate them for lunch once, in a small dark restaurant way up in the mountains. It was the day we were due to climb Sri Pada. I had chosen to have a quiet day hanging around our guest house and the very small village we were staying nearby. The village was basically a collection of shops catering to the pilgrims who came to climb the mountain. There were lots of Sri Lankan sweets and snacks on offer, as well as a frightening amount of cheap plastic toys from China, and your usual Buddhist religious iconography. More out of boredom than hunger, we stopped at another guest house for lunch at around midday. By then we should have been used to the way things work in Sri Lankan restaurants, but for some reason we were still surprised when we’d been sitting there for over an hour and a half with no sign of food. By this time we were starving, and other members of our party had also arrived seeking sustenance. I sipped slowly at a glass of deliciously tart lime juice, hoping to make it last until my food came. Eventually, after an hour and three quarters of waiting, my coconut pancakes arrived. Perhaps they had to grate the coconut while I waited? Luckily for me, today I had a box of creamed coconut in my cupboard. 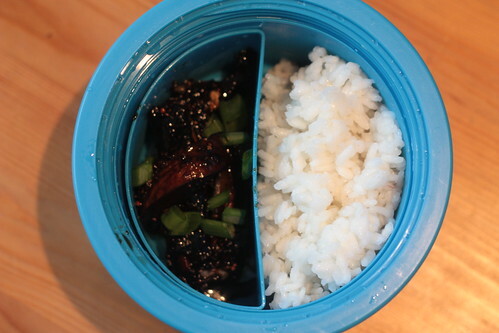 I have no doubt freshly grated coconut would have been tastier, but the creamed coconut worked well enough. To the coconut I added a little bit of golden syrup and maple syrup in place of the kitul (palm) treacle that would have been used in Sri Lanka, and a couple of ground cloves. 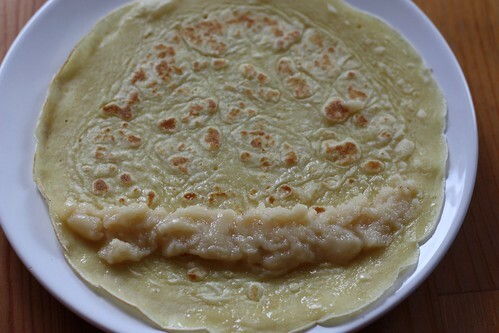 I made a very simple batter for the pancakes, with two eggs, 200 grams of white flour (I used Dove’s Farm ethical flour – they pay a fair price to the farmer for the grain), a pinch of salt, and enough milk to mix it into a thin batter. To cook pancakes, I always use a little butter for the first one. I use a nonstick frying pan at a medium high heat, add the butter, cook the first pancake, and after that the pan is seasoned and usually doesn’t need any further butter. 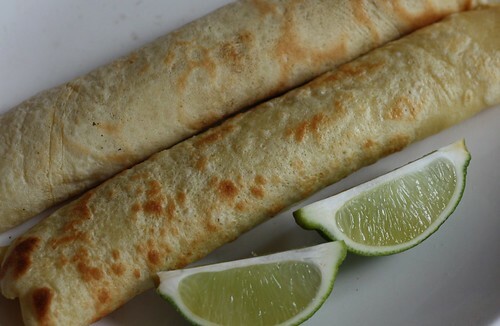 I spread the coconut mixture onto the pancakes and rolled them up. Two was enough as they are quite rich, and I am not planning on climbing any mountains today! They were lovely with a bit of lime juice squeezed over them. Did you see that? I just wrote a whole entry with no mention of Yotam Ottolenghi. But if you thought my Ottolenghi-mania had passed, you’d be wrong. The weekend before last I worked with the Real Bread Campaign at the Camden Green Fair, teaching people how to make real bread and pizzas in a portable outdoor oven brought along by David of Manna from Devon. My local Riverford veg man Paul was also there with a bunch of sample boxes, the contents of which he was very generous with at the end of the day! I walked away with a heaving box of carrots, courgettes, spinach, capsicums, tomatoes, bananas, and a butternut squash. With most of it I just did some marinated roast vegetables with chickpeas and couscous, which did for lunch for most of last week. The spinach became the Green Pancakes from Plenty, and the carrots got juiced. Which left the butternut squash. There were several recipes in my various cookbooks that appealed, but I’d recently bought some pomegranate molasses so decided to try this recipe from the first Ottolenghi cookbook. Served cold, I think it makes for a perfect summer supper. It would be great taken along to a barbecue or served at a party alongside other tasty offerings. All of the flavours and textures just worked so well together and I’m already looking forward to making it again. Preheat the oven to 220°C/425°F/Gas Mark 7. Trim the top and bottom off the butternut squash and cut it in half lengthways. Remove the seeds using a small knife or a spoon. Cut each half into wedges 2-3cm thick. Arrange the wedges in a roasting tray, standing them up with the skin underneath if possible. Brush with half the olive oil and season generously with salt and pepper. Place in the oven for 25-30 minutes, by which time the wedges should be tender and slightly browned. Leave to cool. Reduce the oven temperature to 180°C/350°F/Gas Mark 4. 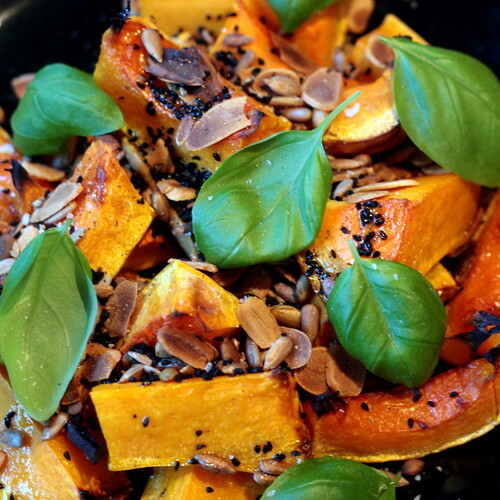 Scatter the pumpkin seeds, sunflower seeds, sesame seeds, nigella seeds and sliced almonds on a roasting tray and toast for 8-10 minutes, until lightly browned. Leave aside to cool. Make a long cut through the aubergine. 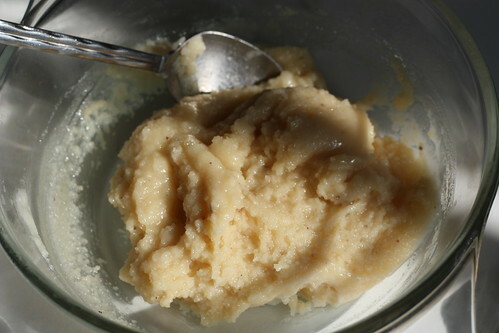 Using a spoon, scoop out the soft flesh while avoiding most of the burnt skin. Drain in a colander for 10 minutes, then transfer to a board and chop roughly. In a mixing bowl stir together the scooped out aubergine flesh, Greek yoghurt, olive oil, pomegranate molasses, lemon juice, coarsely chopped flat leaf parsley and crushed garlic. 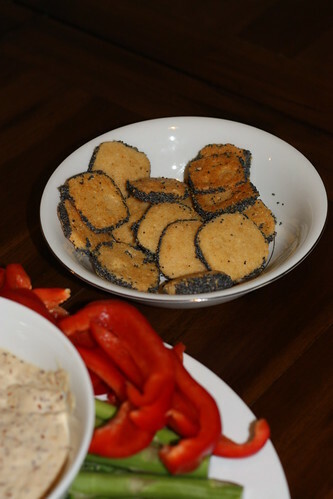 Taste and season with salt and freshly ground black pepper. 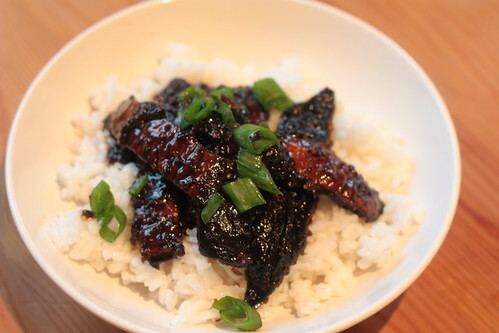 The sauce should be sweetly sharp and highly flavoursome. Arrange the butternut squash wedges on a serving platter, piling them up on top of each other. 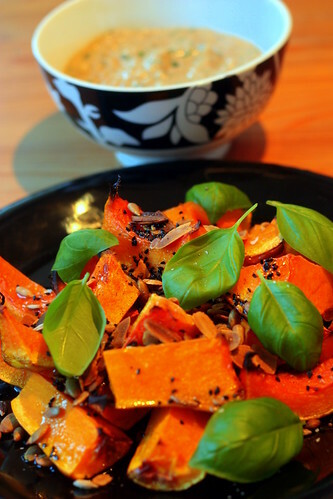 Drizzle with the remaining olive oil, sprinkle the pumpkin seeds, sunflower seeds, sesame seeds, nigella seeds and almonds over and garnish with the basil. Serve the sauce on the side. The box, by Aladdin (and purchased from Amazon), can be microwaved in the morning before work and then keeps your food warm until lunchtime. It seems to work. Since I’m doing a lot of out-of-office work at the moment it’s coming in very handy. ….lame puns aside, I really can’t put this cookbook away. It’s not that I’m consciously cooking everything from the same book. Whenever I get a new veg box, I go through my cookbook collection matching ingredient to recipe and Plenty always seems to come out on top (perhaps it just has the best index, come to think of it). I find cabbage a particular challenge. 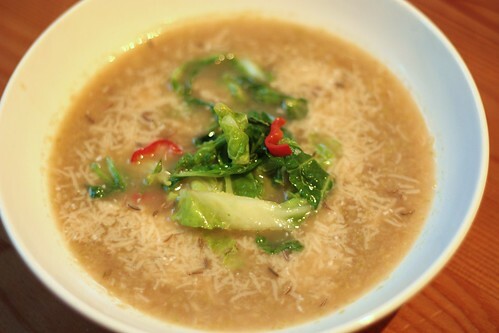 So when I had a Savoy cabbage in my box and wanted to do it justice, I turned to my cookbooks again and was immediately drawn to the Savoy cabbage and parmesan skin soup recipe. Parmesan skins are something we’re never short of, thanks to Camilla’s boyfriend who regularly supplies us with Parmesan direct from Italy. I had all of the other ingredients on hand, including some delicious homemade stock made with Ottolenghi’s suggestion of adding prunes to deepen the flavour (it works). A lovely touch to the soup is that you reserve some of the cabbage leaves, fry them until bright green, and add them to the soup along with some chopped chillies just before serving to add visual punch and textural interest. The soup is already flavoured with the Parmesan rinds but you can add an extra grating right at the end too. The taste? Extraordinary. There’s no way you can go wrong with anything that has that much Parmesan in it, but it truly is more than the sum of its parts. And it was very easy to make too. The recipe is another one taken from Ottolenghi’s New Vegetarian archives, so if you’d like to make it you can find the recipe here (although the version in the book does not contain the croutons). 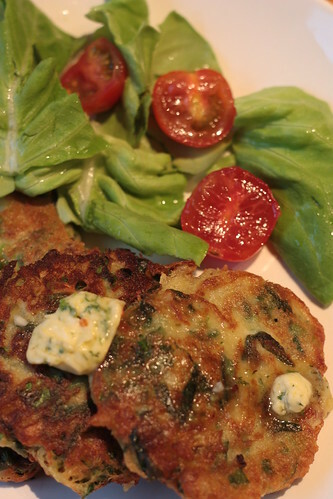 While we’re talking Plenty I may as well write about the Green Pancakes with Lime Butter, which due to getting spinach two weeks in a row and having lime butter left over I have now made twice. Not that I have any problem with that, as they were also delicious. 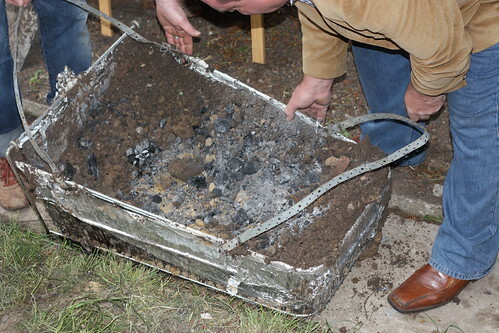 A hangi is a traditional Maori earth oven. A pit is dug, a fire is lit, meat, potatoes and kumera are placed in the embers and covered with earth until they are cooked. Shamefully, when I left New Zealand in 2007 I had never had a hangi before. On a holiday back there in 2008 I went to a Maori experience evening thingy, where they gave us hangi-style food that had however been cooked in a machine. It was on another trip out of London, this time to the unknown wilds of Essex, before I witnessed my first hangi (or imu, the Hawaiian word for it) in action. I was at Danny, aka Food Urchin‘s house, with a bunch of other food bloggers who had all been invited because we had taken part in Danny’s “Where’s My Pork Chop?” project. Yes, all of these crazy people had volunteered to cook a packaged, takeaway dinner for a complete (well almost) stranger. Danny got up very early in the day to light the fire, while the rest of us followed his tweets as the sweet Welsh lamb Myfanwy was laid to rest in the pit. Arriving at Danny’s place I could tell he was very nervous to see whether the hangi had worked. I took along some Parmesan and poppy seed biscuits from the Ottolenghi cookbook (of course – and there are two more Ottolenghi posts to come after this one. I can’t help myself, I’m an addict). Seen in the foreground are Celia Brooks Brown’s allotment veggies with a delicious sesame seed dip she made. We munched on these appetisers until poor Myfanwy was ready to be exhumed. 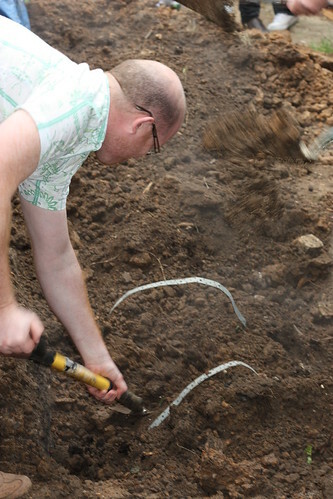 Here we see Danny digging up the lamb – he’d made it quite difficult for himself by making the hole really quite deep! However the first smells of cooked meat came wafting out at this stage. Myfanwy’s coffin was a repurposed shopping trolley. You’ll be pleased to know the lamb emerged cooked and mostly intact. The meat eaters of the party fell on it voraciously and pronounced it excellent. Luckily, there was a delicious vegetarian alternative provided by Ginger Gourmand, as well as delicious salads and sides brought by other guests. A couple of weeks ago, Helen of Fuss Free Flavours and I announced the start of Breakfast Club, which we hope will challenge our readers to come up with interesting and delicious new ideas for breakfast. The theme for the first month is Asian. 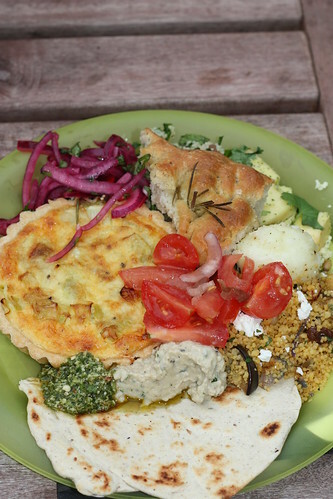 All you have to do is create a tasty Asian breakfast, blog about it (or if you don’t have a blog, take a photo) and email this month’s host Helen with the details before the last Sunday of the month (Sunday 27 June). For more info check out our original announcement post here. Now the exciting news is that we now have a prize for the creator of our (well, Helen’s) favourite Asian breakfast! 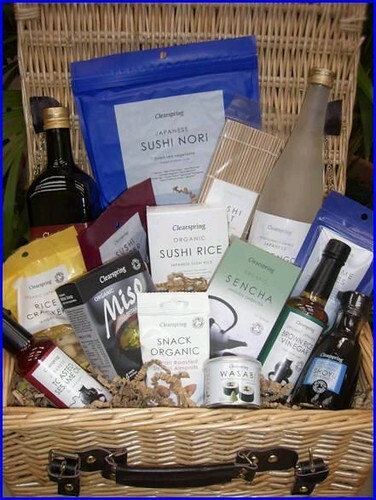 Clearspring have promised us an impressive-looking sushi hamper containing everything you need to make authentic sushi (minus the fresh ingredients). Helen and I both love Clearspring products and use them all the time so it’s exciting to be able to offer this prize. Time to have a good think about what I’ll be making!